The first Henry Daniel was a commemorative bottling marking the birth in 1997 of Henry, our second son. And somehow, I got it in my mind that we should celebrate that birth a few more times, so eleven years later in 2008 I bottled another one and anticipate a third version from 2017. Now, one may ask why I waited until now to release a wine made over ten years ago, and that’s a valid question, particularly in a world that only seems to value things young and new. The truth is that it was a small project consisting of 3 barrels, and after bottling it appeared to be the kind of wine that needed some time to come around. And, I was slow to get labels printed for it, and kept putting it off…. silly excuses, but you’ll be happy for my procrastinations! Like the original in 1997 this is a big bombastic Syrah that can be enjoyed now and for the next 10 to 15 years. 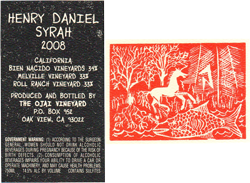 Sourced from Bien Nacido, Roll Ranch, and Melville, the 2008 Syrah Henry Daniel is still youthful, though now the tannins have softened and it shows some development in its ripe blackberry, smoked meats, licorice and black olive aromas. Deep, rich and concentrated, with plenty of depth and structure, it’s drinking gorgeously today. The first Henry Daniel was made during our 15th vintage, the 2008 with our 26th and the 2017 with our 35th. That’s quite a span of time and I realize now that the wines speak to the evolution I’ve gone through in this craft. The 1997 was the result of an incredible hot spell just as the Syrah was ripening, resulting in a wine that was oversized in every way. It wasn’t what I was aiming for, but folks enjoyed it for its exuberance (and by the way it still drinks well). By the time I made the 2008 I was painfully aware of how, by keeping the yields small for quality’s sake, one had to be hyper aware of the weather in order to bring in grapes with perfect ripeness, neither too much or too little—capturing the balance needed for a truly fine wine. At the time I was still stuck on extracting every last bit of character from those grapes, and that made for a wine that needed ten years before it would reveal its attributes. But hey! It’s doing fine today. As for the 2017, you’ll just have to wait to taste it. But count on something more exotic and savory, delicious and approachable, yet poised to age for 20+ years.